Today’s topic is cooking. Well, a brief introduction at least. It has taken me years to even learn the basics because I’m not much of a cook, and when I first came to Japan if I did cook at home I wasn’t working with anyone else most of the time. Some friends and colleagues have indulged in cooking classes, of which there are a good many in Japan. If you do find yourself in Japan living, studying, etc., then I recommend that kind of community activity as real life interaction is one of the best teachers. For now, let’s just get our hands wet. Tomomi: Manaita o totte choudai. Sorekara o-yu o wakashite moraeru? Sam: Un. Nani o tsukuru no? Sam: Oishisou da+ne! Boku no+wa karai no ga iina. Tomomi: Watashi mo. Hito-fukuro o ue no todana kara totte kureru? Sam: Migi to hidari docchi ni aru? Tomomi: Migi no tana no arumihoiru no tonari ni aru to omou yo. Sam: Atta! Reitouko kara hikiniku o torimasu. Tomomi: Can you pass me the cutting board and boil some water? Sam: Sure. What are we making? Tomomi: I was thinking we could make some soy milk dandan noodles. Sam: Sounds great! I like mine really spicy! Tomomi: Me too. Can you get a package of noodles from the cabinet? Sam: Is it on the left or the right? Tomomi: It should be on the right near the tinfoil I think. Sam: Found it! I’ll get some ground beef from the freezer. So we’ve got a few words from around the kitchen that can be handy and aren’t covered near enough in textbooks. The first of these is a word I did not learn for 5 years because as I mentioned I don’t cook, and when I used to it was pretty much always in English. That word is まな板(いた), which is a cutting board. It’s typically written as a mix of hiragana and kanji, though there are a few alternatives; the kanji there on the end actually means board or plank. Another word I didn’t know for the longest time was ひき肉(にく), which means ground/minced meat. Refrigerator is definitely high on the list of common words that are just a bit ridiculous…in English. In Japanese it’s 冷蔵庫(れいぞうこ), which is literally something like “cold storage.” It’s also very similar to the word for freezer used above: 冷凍庫(れいとうこ). Only one kanji and one letter changes, which makes it pretty easy to remember the pair. Try not to confuse them though! Lastly, I want to mention 戸棚(とだな) which is made of the kanji for door and the kanji for shelf; together they mean cabinet or cupboard. 引(ひ)き出(だ)し is also useful, meaning drawer; it’s actually pretty easy to remember since it looks like “pull-out.” In my experience, in daily conversation, people will use the word “drawer” to refer to just about anything that even comes close, including cupboards, so when you aren’t sure of the distinction it’s the safest bet to make. In the last article I mentioned て-form, and I wanted to return to that and one of its other uses. In the last article it was used with もらえる to request that someone do something for the speaker. It shows up in this dialogue as well with 沸(わ)かしてもらえる—asking someone to boil some water. Aside from tying verbs together it can also be used to tie sentences together. The first sentence is a compound sentence spoken by Tomomi where she asks Sam to do two things: get the cutting board and boil some water. The “and” in the sentence comes from the “て” of the conjugated verb 取(と) (to take). There are several ways to say “and” in Japanese, but given the versatility of the て-form, I recommend looking into this one first. One of these other ways to say “and” happens to be と. However, the role it is playing above isn’t that of “and” but of the trickiest of Japanese postpositions—in English we have prepositions like “of,” “about,” and “over,” so called because they come in the spot before (the pre-position) the noun they affect, whereas in Japanese に, を, and で, for example, come after the noun they describe. と is generally used in set phrases, such as と言(い)う, which is used when someone says something. Above we have と思う, which is used when someone thinks something. And while 私(わたし)は飛行機(ひこうき)で行(い)こうと思(おも) should always be translated as “I think I will go by airplane,” the と really means something like “in the manner of.” 佳子(けいこ)はうきうきとスキップしている, for example means Yoshiko is skipping cheerfully (or, in the manner of being cheerful = うきうき+と). In addition, とcan also mean “if,” as in 考(かんが)えると分(わ)かる, meaning that “if [you] think [about it] you’ll understand.” But we’re going to leave と at that for now. A blessing and a nightmare when it comes to kanji is just how much alike a lot of them look. Above we see the kanji for right (右) and the kanji for left (左) appear side by side. The “t” looking portion off to the left is a kanji part or radical that means “hand.” On its own it doesn’t mean anything, though it does look a lot like the katakana ナ, but as a part of kanji it generally refers to something to do with hands. Then underneath there is 口 (mouth) on one side and 工 (craft) on the other. The pieces make kanji easier to remember: the right hand feeds the mouth and the left hand is crafty. More complicated kanji are where the similarities can grow into a bit of a burden, but if you get in the habit of recognizing the differences early then it’ll pay off down the road. In the last section we also discussed prefixes and suffixes, and one prefix-esque kanji here is 大 (dai). It takes everything to the next level: 好き (suki) is to like and 大好き is to love; 嫌い (kirai) is to dislike and 大嫌い is to loathe. 大 is the kanji portion of the adjective 大きい (ookii), or “large.” Sometimes in compounds it even shows up as “oo” rather than “dai.” It’s easy to see why it imbues certain words with meaning the way that it does. There’s also a doubled kanji above: 坦々 (tan-tan). Notice how the 2nd kanji is actually 々 instead of 坦? When a kanji is repeated you can write it twice (坦坦), but it is more common to use the symbol you see there to indicate that the kanji is repeated. One of the most common ones new students of Japanese learn is 時々 (toki-doki) for “sometimes.” I should explain 坦々麺 (tantan men) is an awesome type of hot noodle that comes from China. In the translation it’s written as “dandan noodles” because of the way it’s pronounced in Chinese and typically written in English; still it’s good to note that in Japanese it gets the harder “t” sound. Well that about does it for our brief foray into cooking related terms. Even if you haven’t been supplied with the widest range of vocabulary I hope the grammar and kanji advice give you a little guidance in your studies and what to watch out for. 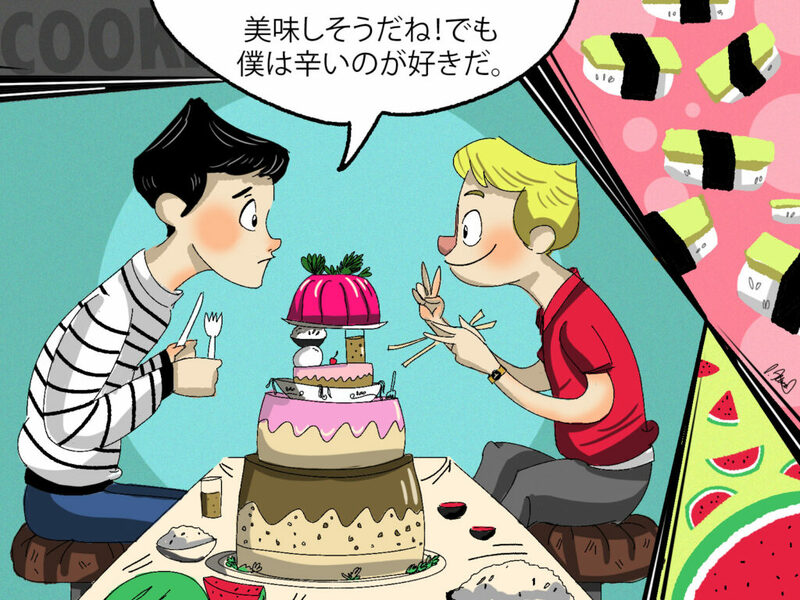 The key to learning Japanese (and probably any foreign language) is to find that thing you love and roll with it. If music is your deal, target that. If you’re big into cooking, you can learn a lot from reading and deciphering a Japanese recipe book. If you’re like me and kanji is your bag, well then you can throw yourself into those twisting ciphers and shapes that have such a vibrant and visual history. Do what you love and you’ll find yourself often more capable than someone who focuses too much on being well-rounded. That’s just my two cents, though.